When photographic architecture, landscapes and even people, photographers often desire to increase detail and resolution, capture a wider angle or create a unique look that is impossible to achieve with standard camera gear. That’s where panorama photography comes in – it can be a great technique to utilize in order to accomplish such goals. Although the concept and the technique itself are fairly straightforward, panoramic photography often confuses many photographers. We often get many inquiries about this topic from our readers and one of the most frequently asked questions is about the specific type of gear to buy in order to produce stunning panoramas. And that’s certainly one of the biggest myths about panoramic photography – you rarely ever need such gear! Most of the panoramas I have stitched so far have been done without panoramic gear and although I do own a panoramic slider, I rarely ever get to use it. Read on this article on panorama photography tips to find out why! This is the largest panorama I have produced to date. At 400 MP, this image has so much detail that it could be easily made into a wall-size print at fairly good DPI. I would not have been able to produce this much detail in a single shot even with the highest resolution digital camera today. Shot on a high resolution DSLR using a standard tripod head. 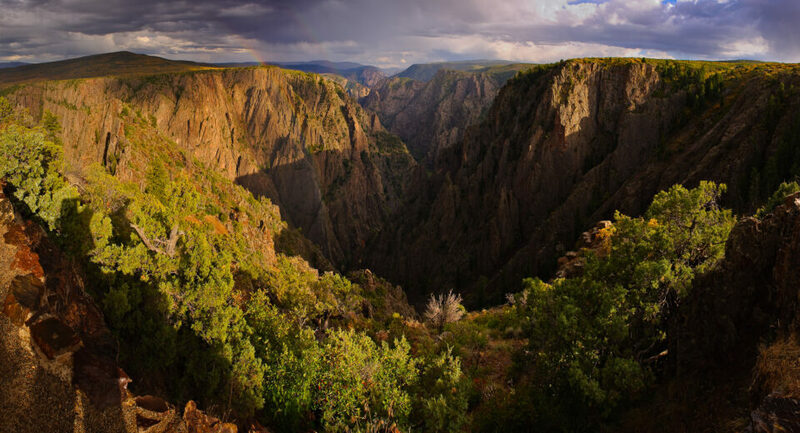 At PL, we have written quite a bit about the subject of panoramic photography. A while ago I wrote a detailed tutorial on panorama photography, where I cover a lot of the basics of this technique. The topic was further expanded by a number of other contributors like John Sherman, who wrote an article on how to create HDR panoramas in Lightroom, Spencer Cox, who wrote an article on the hidden benefits of panorama photography, and my friend Brad Judy, who wrote an article on how to stitch images with Microsoft ICE. On top of all this, we have even written about a method of stitching panoramas when photographing people for that unique, shallow depth of field look, which was later expanded to a Lightroom tutorial, including an article on fixing panorama merging errors. In short, a lot has already been said about this technique, which is why I want to cover some specific panorama photography tips and the myths surrounding it. 1) Are Panoramic Heads Absolutely Required? Let’s start with the biggest myth surrounding panoramic photography – that you always need a panoramic head. Many photographers advise that a panoramic head is absolutely required for proper stitching of panoramas and that it is a must-have piece of gear. That’s certainly NOT true and I would personally stay away from such unsupported statements. The fact of the matter is, panoramic photography gear is ONLY needed when the scene contains close foreground objects and if you are shooting with lenses other than tilt and shift. When you photograph from a high vantage point / overlook or a point where the nearest foreground object is located at infinity focus, you do not have any concerns with parallax. So you could easily make a large panorama without any special equipment. I have stitched many panoramas without any special equipment, including the Zabriskie Point panorama you see in the beginning of this article. Why don’t I use a panoramic head whenever I can? There are several reasons for this – let’s take a look at them in more detail. I shot this panorama hand-held. Light conditions were changing so quickly due to high wind and clouds, that I simply would not have been able to set anything up. Although I tried to rotate my hand around the entrance pupil of the lens, there were still some stitching issues to deal with. I had to use some cloning in Photoshop to take care of those. Lack of time is one of the biggest reasons why I rarely get to use a panoramic head. Although I do everything I can to prepare well in advance of shooting a particular scene (which I would have typically previously scouted and researched for), I don’t always have the time to set everything up for a panorama. Unfortunately, once you get into complex panoramas, especially the ones that involve multiple rows, it can take quite a bit of time to get everything fully leveled, prepared and tested. If there are any foreground objects, or if you shoot at longer focal lengths and parallax can be a potential issue, you would have to also make sure to get the camera and lens moved to their “no parallax” point (which you would need to know well ahead of time). And God forbid if you decided to zoom in / out (change your focal length) and forget about moving the setup accordingly – that’s a recipe for a potential disaster. In short, stitching complex panoramas takes time and patience, and if you should be prepared to deal with all those issues. Another reason why I often don’t shoot panoramas is due to wind. If it is extremely windy, forget about panoramas. Not only does wind cause objects like trees and bushes to move, which would make it a real pain to try to stitch, but the wind would also shake your setup and potentially cause blur in your images. One of the biggest frustrations with shooting panoramas, is later discovering that a single image out of your sequence was blurry! I have had so many great panoramas, which I never ended up using, just because one or two images from the sequence was completely unusable. Why didn’t I pay enough attention in the field? That’s what the next section is all about – timing. I shot this panorama hand-held, without any panoramic equipment – there was simply no space in there to put a tripod and did not have any time. Although the panorama did stitch, if you look closely, you will find some parallax errors. In addition, the shape of the kiva got strangely transformed and skewed. When photographing critical moments like sunrise and sunset, where everything happens too quickly, you might regret the decision to shoot panoramas fairly quickly. Why? Because everything happens too quickly and you cannot quite do that with a panoramic setup, especially if it involves more than 5-6 exposures. When shooting at low light levels, which is typically the case when you shoot sunrise / sunset moments, if your exposure time is too long (say more than half a second), shooting panoramas can be a bad choice. First of all, light levels will change too quickly during these peak moments. Even if you shoot in full manual or lock your exposure (which is required for proper panorama stitching), by the time you are done with the whole panorama, the brightness of the scene might have drastically changed, making it impossible to produce an even panorama. On top of that, long exposures would cause the scene to change too! For example, if you have clouds in your scene, even half a second might be too long for such panoramas, since the clouds would be in a completely different place in your last shot of the sequence. Lastly, if you do decide to shoot changing conditions, you will need to learn how to do everything at a very fast pace. So you need to be fully aware of such potential – if conditions change too quickly, shooting a panorama might be a complete waste of your time. Another panorama that I shot hand-held, without any panoramic equipment. I was standing on the top of the dune as I shot the panorama, so I did not have to worry about foreground elements / parallax issues. It was extremely windy and cold, so I had to increase my ISO a bit to keep my shutter speed fast enough. Many photographers, including myself, end up shooting panoramas of scenes that are not worth shooting in the first place. Sometimes the scene itself is not very photogenic, sometimes there are too many distracting elements and other times, the light is just too flat. I have taken countless panoramas that I never stitched, because I would not have been pleased with the results. It is one thing if you are starting out and shooting panoramas for practice, but totally different if you find yourself shooting those pointless panoramas that are no different than your average “crap shot”. Sometimes you are far better off spending your extra time scouting locations and finding something interesting to photograph, than wasting your time figuring out those “no parallax” points or sitting and waiting for hours trying to get your computer to finish the stitching process. And how about spending a lot of money on expensive panoramic heads that are too heavy to lug around with in the field? I value my time and if I see a scene that is absolutely not worth shooting, I won’t do it. The more crap you shoot, the more time you waste. More images to import, more images to store and more time to waste just to figure out at the end that it was all not worth the effort you put into it. Why did I shoot it in the first place? Because I had no idea what I was doing at the time. Another reason why you might want to stay away from panoramas is huge storage and fast computer needs. 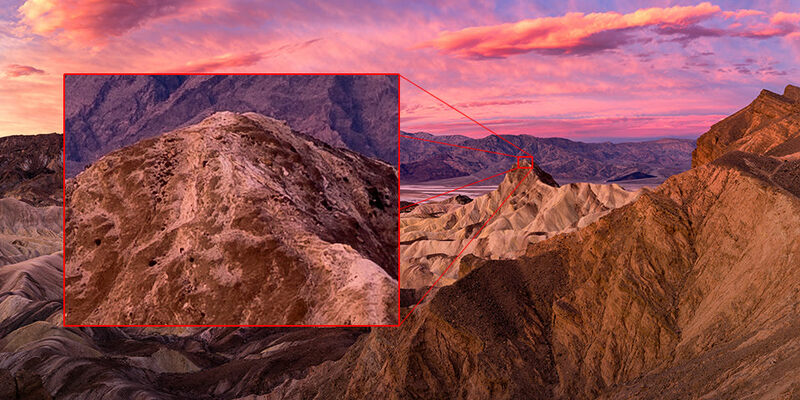 Guess how big that 400 MP of Zabriskie Point panorama is? Almost 4 GB! Yes, that’s a single file with all the details in it. In fact, Lightroom could not even handle such a file, because I had to save it in a different format (PSB), as files over 2 GB cannot be saved in the common TIFF format. But that’s not the worst part – the process of stitching the panorama was quite painful. Since I now prefer Lightroom to stitch panoramas (due to the fact that Lightroom 6 / CC is capable of creating DNG files that can be edited just like RAW images), multi-row panoramas can take a really long time to stitch and in some cases, they cause Lightroom to crash completely. 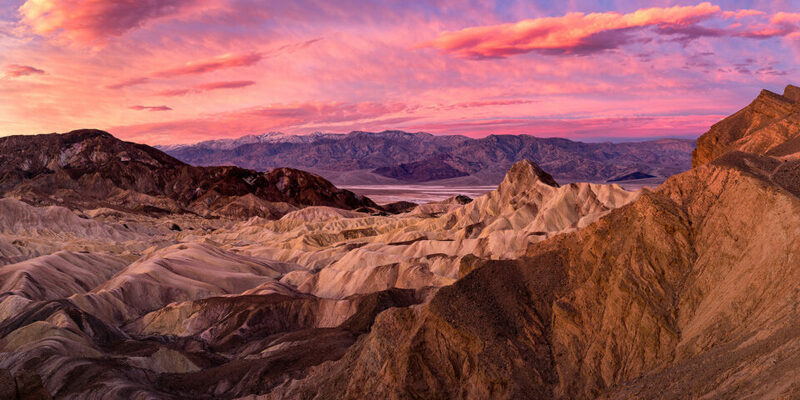 For the Zabriskie Point panorama, I had to retry about 10 times before the panorama finally stitched without issues. In between, I tried out PTGui as well and although it did a great job overall, it was still not able to produce a DNG file. So once Lightroom finally did it, I ended up going to the DNG version, as I had more editing room to play with. My second part of the struggle was the editing process. Both Photoshop and Lightroom made my fast PC look like junk, literally. I quickly realized that 32 GB of RAM was inadequate and if I wanted to speed everything up, I would have to down-sample my panorama to smaller resolution. Keep all of this in mind. Unless you only shoot a few images, those multi-row panoramas might give you a lot of different kinds of headache, which start after you offload those images to your computer. I cannot even imagine what folks like Aaron Priest go through when they stitch multi-row panoramas shot in HDR! (by the way, check out his excellent article on photographing the Milky Way). This was my first panorama that was stitched with extremely long exposures of 20-30 seconds. Check out this article, where I explained how and why I shot this panorama. It is a single row panorama using a standard ballhead – no special panoramic equipment was used. With all this talk about why I often choose not to shoot panoramas, you might have gotten a feeling that I am against panoramic photography. No, that’s definitely not the case. I do shoot panoramas when the conditions call for them and I rarely regret my decision after the fact. Panoramic photography is a wonderful technique for many reasons – Spencer did a great job at explaining those in his Hidden Benefits of Panorama Photography article. Being able to get a different angle, increase resolution for ultra-large and super detailed prints are the primary reasons why I sometimes shoot panoramas. Over time, I learned how to scout locations for panoramic photography, anticipate light conditions and set up my gear quickly for proper single row or multi-row panoramas. As you practice this technique in the field, you too will find out what works and what does not for you. Despite all the factors and disadvantages pointed out above, I would still encourage everyone to give panoramic photography a try! At 400 MP, it has so much detail that I could make it into a huge wall-size print, or a smaller super-high resolution print that you could pixel-peep at close distances. When your lens moves around the tripod base of your camera, the background relative to your foreground subject would appear differently between shots taken at different framing positions. Although many software packages today have methods to deal with slight parallax issues, severe parallax errors yield to badly stitched panoramas. In extreme cases, software sometimes cannot even stitch such panoramas. You can see from my shadow on the left that I have been shooting vertical, hand-held panoramas for a while. This shot was captured back in 2008 with the Nikon D700 using this technique – a total of 6 exposures. Crazy to think that I could capture a panorama today with similar resolution using just two images with the Nikon D810! The solution is to use proper panoramic equipment, which would allow moving the rotating base away from the camera to the entrance pupil of the lens. Once properly set up and the camera rotates around the entrance pupil of the lens, or the “no parallax” point as often referred, software won’t have any problems stitching such panoramas and there won’t be any issues in the resulting images. This particular image would not have been properly stitched without panoramic equipment, since the rocks are so close in the foreground. I used my nodal slide and shot a total of 9 vertical images, which I later stitched in Lightroom. If you are serious about panoramas and you are planning to shoot a lot of them, or if you do architecture photography where you typically deal with close foreground objects, you will surely benefit from a solid panorama head – that’s when investing in such a setup will be beneficial for your photography. And this is where a lot of people get stuck, because there are so many different options and so many different price points. When it comes to panoramic photography, you can spend as little as $50 and as much as thousands of dollars for advanced motorized heads. There are many different manufacturers of panoramic heads: Nodal Ninja, Manfrotto, Cambo, Bushman Panoramic, Gigapan, Really Right Stuff, Kirk Enterprises, Agnos, Novoflex and many more. So which one to get then? If you already have a solid Arca-Swiss tripod head with a leveling base, I would recommend to start out with a single nodal slide. When it comes to tripods and tripod heads, I believe in investing once – get yourself the best tripod and tripod head you can buy and never worry about it again. For this reason, my choice for the tripod heads has been Really Right Stuff (RRS), because well, they do make the really right stuff. RRS is one of the most expensive brands out there for a reason: they make everything in the US and their quality is top notch. I own a couple of RRS heads and my most favorite one is the RRS BH-55. I have used many different tripod heads in the past and once I tried out the BH-55, I could not use anything else. Yes, it is that good. The best part about the BH-55 is that it is modular – you can use a panorama-friendly clamp like the PC-PRO. With this clamp on my BH-55, I don’t have to worry about leveling my tripod legs. Once I make sure that the tripod stands securely, I level the clamp itself, then mount my camera on it. But the BH-55 with the PC-PRO clamp won’t solve the parallax issue – you will need one more component, which is the MPR-CL II nodal slide. Basically, you attach your camera in vertical or horizontal orientation (I prefer vertical for more resolution), you slide the clamp on the PC-PRO, then secure it at the point of no parallax. From there, you can use the panning base of PC-PRO to pan the camera. The setup is not ideal for shooting multi-row panoramas, but it can be done. When shooting multiple rows, all you have to do is release the tension on the BH-55 ballhead, move the setup up or down, lock the ball and continue using the panning base of the PC-PRO. What’s great about this setup is that I only need to carry a single lightweight MPR-CL-II nodal slide with me. If I decide to shoot a panorama, I mount it on my PC-PRO/BH-55 and I am ready to go. What’s not great about this setup is cost – BH-55 PCPRO itself is $575, plus $140 for the MPR-CL II – $715 total. For most people, full size heads are overkill. If you don’t want to spend so much money, just get a single slide if you already have a solid ballhead with a panning base and you should be good to go. It might take a bit more time to get your tripod leveled, but it will save you hundreds of dollars. If I wanted to get a budget-friendly setup, I would personally go for the Sunwayfoto FB-44II Ballhead, along with the Sunwayfoto DMP-200R nodal slide. If you shoot panoramas with wide angle lenses or small-size lenses, get the DMP-140R instead. Or get both, since they are so cheap. That’s $160 for the ballhead and $55-70 for the nodal slides – less than $250 for the whole setup. Not bad. If budget, size and weight are not an issue and you want to make a living selling wall-size prints, you might want to look into full size panorama heads. If that’s the case, don’t settle for cheap full size heads – get the best. The last thing you want is to be frustrated in the field, just because you invested in a flimsy setup. My number one choice would be the RRS Multi-Row Pano Package, which includes the PG-02 LR Pano-Gimbal Head with B2-LR-II clamp and the above-mentioned MPR-CL II nodal slide. At $795 for pano is not cheap, but it is still pretty competitive if you compare such a setup to other high-end brands like Nodal Ninja. For example, Nodal Ninja’s Ultimate M2 is around $700 and if you want to go take panoramic photography to another level, the Nodal Ninja Ultimate M2 Giga will cost you a whopping $1,000. For me, such high-end gear is not very practical in the field, since it not only adds quite a bit to the weight of my bag, but also occupies the precious space of my Think Tank Airport Commuter camera bag. 5) Always Take Your Safe Shot First! Whenever you decide to do a panorama, my recommendation is to always start out with your “safe shot” first, which is a single shot of whatever you are trying to photograph. In case things go haywire and your panorama does not work out, the last thing you want is come back with absolutely nothing, especially if the conditions were just perfect. When shooting in the field, I always make sure to take both panoramic and non-panoramic images and I recommend that you do the same – it is certainly a good practice. When I do panoramas, I always shoot vertical. Why? Because I get more resolution. If I shoot horizontal, I could capture the whole scene in just 3-4 images. If I switch to vertical, I have to shoot around twice the number of images, but the end result is worth it – I get way more resolution from a single row panorama. Another tip is to avoid shooting too wide. If you shoot with wide-angle lenses, especially those that distort the scene too much, you will typically not only add too much crap to the scene (empty sky, too much foreground, etc), which translates to loss of resolution due to cropping, but your scene might also stitch with too much distortion built-in and you will find yourself trying to fix all that using various post-processing tools. I find that focal lengths between 35mm and 70mm on full-frame cameras (approximately 24mm – 50mm on APS-C) typically work quite well for panoramas. When doing multi-row panoramas, you will need to use even longer focal lengths for more details / more overall resolution. When shooting multiple rows, make sure not to go crazy about shooting the sky on its own row – unless you have distinct clouds that are not moving too fast, you might have a hard time stitching it all together later on. I usually try to include at least a little bit of the ground when including the sky, so that the software can use that part for stitching. Hope these tips help with your next panoramic adventure. If you have any questions, please feel free to ask in the comments section below! Great stuff Nasim, I was waiting for this one. I want to shoot a large pano with a 500mm on a FX body. What do you think? Anything I should be concerned about? I think the detail would be incredible. I am not sure if the lens will work with my Arcatec Nodal rail to deal with parallax but I am going to give it a try. Monte, you would struggle a lot with that one, unless the plan is to take a few images only. When shooting at such long focal lengths, it is best to use a motorized head – making minute adjustments at 500mm would be extremely difficult. I have done one multi row panorama at 300mm and it was a real pain. I had to downsample and convert all images to JPEG, or the software would have taken forever to stitch. I think I had a total of 220 images! For that reason, usually my single or multi-row pano, i restrict myself to 70mm, cos it would be too tedious to shoot pano at longer focal lengths, and gusty winds and unstable platform (from nearby tourists) would cause blurring of images (though shutter speeds having 1/focal or faster helps). Previously I used RRS’s leveling base combined with PC-PRO panning clamp, but replaced with an Arca Swiss P0 monoball with panning which is significantly lighter and faster deployment. Lee, very true – I also rarely shoot beyond 70mm. Too much work! Please clarify “panoramic photography gear is ONLY needed when the scene contains close foreground objects and if you are shooting with lenses other than tilt and shift” with regard to tilt/shift lenses. I don’t think you mean that you need pan gear if shooting with non- T/S, which is almost always. Jack Dykinga has written about using T/S lenses to do pans, but the Nikon 24mm PC (T/S) lens will only let you roughly double the width you get from one frame: half a frame to the left, and half a frame to the right as you shift….right? Doesn’t seem very useful. Is there another way to use the T/S? What I think Nasim meant was if the scene contains near-field subjects (eg long/linear fencing or a jetty extending out to the sea) the use of calibrated pano gear with correct NPP (no-parallax-point) is essential, otherwise the far-field mountains will stitch perfectly, but the near field jetty/fencing will have broken lines. However, if there is an absence of distinct near-field subjects, one can easily get away with shooting pano hand-held. I understand the near field parallax business. I’m asking about T/S lenses. I would think TS lens are more for perspective control, one side advantage from using the shift function is to shift left/right or up/down. With limited “wideness” compared to pano gear. Hmmm, all the while my understanding is tilt changes the focal plane of the image, while shift does not, ie, it just slides left/right/up/down while maintaining the focal plane. Oops, I messed up the two – you are right, it is shift for panos. Need to get some sleep! Lee, I apologize for the verbiage mix up earlier – I removed my comment to avoid confusing others. You are right, when stitching panoramas, you use the lens “shift” function to move the shot up and down or left to right. Not particularly useful, since you don’t get much coverage. Anthony, I changed the word “or” to “and” to make it sound more correct. Basically, if you have a tilt-shift lens for shooting panoramas and you use their shift function, you do not need to have a panoramic head. Unfortunately, tilt shift lenses can only be useful for small panoramas – you can only do about 3 shots total. Not a lot, but still helpful. So you are right, doing panos with tilt shift is not super useful. Great helpful article. I keep learning more all the time. Thanks. It’s the point around which the camera and lens rotates to give a pano without parallax errors. It’s somewhere between the tripod mount and the end of the lens. If you set up a camera and lens on a pano rail with a view of say two lamp posts in a line, it’s the point on the rail where the lamp posts stay in line when you rotate the lens and camera. George, Murray beat me to it :) One thing to add – every focal length on a lens has a different spot where entrance pupil is located. That’s why for a lens like 24-70mm, you need to know where to move the setup based on focal length. I normally use my Canon EF 24-70 F4L and 16-35 F4L to shoot panos, be it single or multi-row. For the 24mm ~ 55mm, I can stay put at the same NPP nodal point (the stitch errors are less than 3%), but need to change to another nodal point for 70mm. For the 16-35, the same nodal point can be used for all ranges and the stitch errors is well below 3%. where is the nodal point of the 16-35 f4l? I didn’t find any documentation about this. By “entrance pupil”, Nasim means the aperture (the part of the lens that gets larger and smaller when you adjust the f-stop). Unfortunately, the position of the aperture isn’t labeled on most lenses, so it can be an educated guess or trial and error to find it. Murray’s lamp post suggestion is a great way to find it through testing. Many textbooks and online articles contain incorrect information on this topic. I think the reason for the errors is the thin lens model, which does not apply to real camera lenses. In the thin lens model, the nodal points, the aperture, and the entrance pupil are all located in the same plane — the centre of the thin lens. In all practical lenses the nodal points are separated, but neither of them, nor the aperture blades, are located in the same plane as the entrance pupil. The location of the nodal points and the aperture blades is irrelevant to photographers. 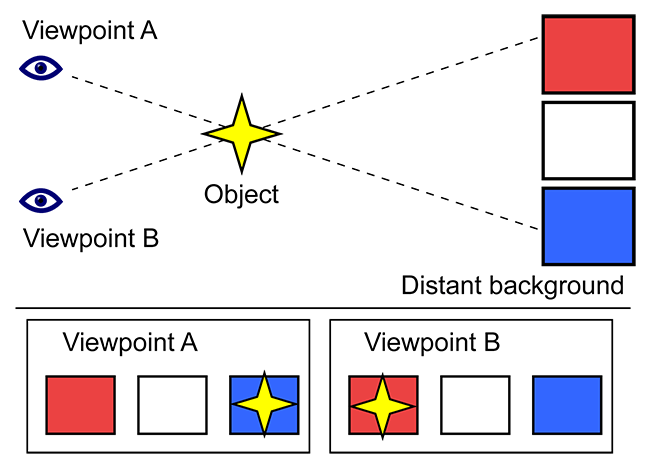 The only thing that matters is the location of the entrance pupil: this virtual aperture [it’s called virtual because it doesn’t physically exist] is the very thing that determines the mapping of 3D object space onto 2D image space; including perspective, parallax, and depth of field. As George stated, the plane of the entrance pupil is indeed the only plane around which the lens can be rotated without causing any parallax errors. With modern complex lenses the easies way to estimate the location of the entrance pupil is by looking into the front of the lens, when it is off-camera and partially or fully stopped down: the apparent location of the aperture blades is the location of the entrance pupil. With zooms that use an internal focus mechanism, the location of the entrance pupil is very likely to change with zoom setting and with focus setting. George asked: Could you please explain “entrance pupil”. I think the simplest way of explaining it is: The entrance pupil of a complex lens is its thin-lens model equivalent in 3D object space, for the majority of practical purposes. Nasim, when you say “panoramic photography gear is ONLY needed when the scene contains close foreground objects or if you are shooting with lenses other than tilt and shift”, did you mean to say “panoramic photography gear is ONLY needed when the scene contains close foreground objects AND if you are shooting with lenses other than tilt and shift”? In other words, you may need pano gear when you have close foreground objects but not if you are using a tilt/shift lens and can get the pano with the shift and say three exposure. I often pack a simple pano rail with my tripod; it takes little space. I use one from Hejnar Photo which is much cheaper than RRS but then I use (Acratech) clamps that are both lever and screw so I don’t need to worry about compatibility between brands. The Acratech heads have a useful capacity too. You can turn them upside down to make them into a panoramic head which saves buying an attachment. Murray, yes, you are right – thanks for the correction. I fixed it in the article. Very helpful and informative article. Your explanation of taking panoramas using less equipment is refreshing, money not being the issue but the added weight and bulk one must pack as I get older is becoming a big problem. 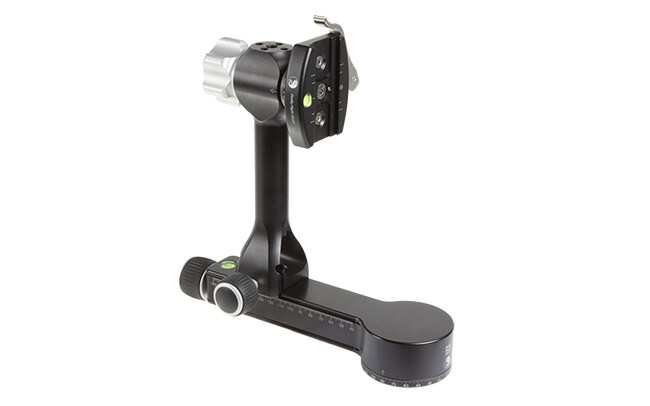 By using the RRS BH-55, with the PC-Pro clamp, with a nodal slide and rotating the ball to 90 degrees it appears one should be able to take multiple row Panos. I realize it may not be ideal in all cases or for all lens but for Landscapes using a 24-70mm lens it seems it should be workable. I would not go into so much trouble just for a picture. I would just go online, download the high resolution picture of the place I like and print it if I want. Obviously you are not a photographer, but that is OK. Everybody has different interests. BTW photos on the internet are not public domain. It depends on two things: the stated usage rights for the image [which need to be stated in the EXIF metadata as does traceable authenticating details of the photographer whom is claiming the copyright]; the jurisdiction applicable to one’s locale. These two factors are neither mutually inclusive nor mutually exclusive across the globe. Many images (and other articles) published via the World Wide Web (WWW) are indeed in the public domain; many are not. True. I did make a blanket statement, but I thought it was necessary and educational. George, I agree that your blanket statement was educational and it was definitely necessary in order to adequately warn people about the potential harsh consequences of copying copyrighted works. Good article, Nasim! Thanks for the mention. I wrote an article some time ago about file formats and their size limitations for panoramic photographers that folks might find interesting. I recently updated it to include Lightroom CC’s new features: galleries.aaronpriestphoto.com/Artic…aFileSizes TIFF format actually supports up to 4GB, but some older apps are still limited to 2GB. Most modern apps support 4GB TIFFs though. 32GB RAM is indeed limiting with very large panoramas in Photoshop. PTGui has the best performance for high resolution panoramas, though I often prefer Photoshop’s own blending over it. It takes a lot of RAM and swap space to blend gigapans with Photoshop though, even if you do the alignment with PTGui or AutoPano. One of the biggest reasons I recommend a nodal slide, and especially a multi-row panning head for more than one row, is for easier alignment and stitching of blank areas like sky and water, or out of focus areas if shooting a bokehrama. Parallax is not the biggest reason for me to use a panning head. If you are very careful and shoot precisely on the index marks of your panning head, and document how many degrees you turned horizontally & vertically, you can very easily align your images in a dedicated stitching program like PTGui with its “Align to Grid” feature. If you shot it properly on the no-parallax point for your lens, it will space the photos out where they should be before even generating control points. Photoshop does not have this feature of course, you need specialized software like PTGui or Autopano. Some robotic panning heads can generate a Papywizard .xml stitching file that makes this even more precise. The Gigapan Epic Pro sadly does not have this feature, but PTGui’s Align to Grid command still works well with it. If you have a click-stop rotator like Nodal Ninja makes, this is nearly as accurate as a robotic panning head. However, a good robotic head can shoot less columns per row around the poles of a sphere, which necessitates an .xml stitching file to align the photos later. Align to Grid assumes the same number of columns for every row. Lightroom and Photoshop stitch very well though if you have enough sharp content in every image for it to recognize how the images should be aligned. I shoot a lot of handheld panoramas and blend them with Lightroom just fine. It’s when you get into multi-row, 360°, spheres, night sky, close subjects, featureless images like blank sky/water, or out of focus images like bokehramas that nodal slides and panning heads make all the difference! I understand putting the RRS PC-Pro clamp above the ball head, but could you explain what you mean by below. Sure! I was referring Nodal Ninja’s RD16 II click stop rotator. If you were using a ballhead instead of a leveling base on the tripod you would put the rotator on top of the ballhead. But it would sit underneath your multi-row panning head. A leveling base has a much lower profile with lower center of gravity than a ballhead for stuff like this, but it does not have the range of tilt that a ballhead does either of course. I have RRS’ TA-4-LB-HK leveling base on my TVC-34L. I also have a BH-55 ballhead that I can put on it via a dovetail when I’m not using the pano/gimbal head or a Panoneed robotic head. All three use a quick-release clamp and dovetail plate for easy swapping. Aaron, you mention using the index marks on the panning head to help with stitching in PTGui. I use Lightroom CC or Photoshop CC, instead of PTGui. I generally use the index marks to tell me how much arc I need to rotate through, such that the sequence of images overlap by about 1/3 to assist stitching. Should I be using the index marks in some other way? If so, could you provide a bit of advice on set-up and technique for using them? It won’t matter as much with Photoshop / Lightroom as they have no structured panorama support. PTGui and AutoPano (maybe Hugin too?) allow you to space your photos out evenly by x degrees vertically and horizontally before aligning, which is very useful for things like featureless skies, water, blank walls, etc. So if you know how many degrees you rotated on your panning head by using the index marks, and you documented it, and if you were on the no parallax point of your lens via a nodal slide, then in theory all the images will line up before finding any control points or blending. It’s much more accurate than Photoshop guessing by analyzing image content alone, particularly when there is confusing content like night panoramas with stars or repeating patterns in architecture. It’s also useful for lower end motorized heads like the Gigapan Epic Pro that shoot a regular grid pattern, but don’t store an .XML positioning file with the data. Your use of the index marks to overlap by about 30% is ideal and more efficient/faster than eyeballing it in the viewfinder I think, probably less prone to error too. You could do more with that data in other programs, that is all. That being said, if Photoshop/Lightroom has enough content to accurately stitch, I don’t bother using another app. Adobe does a great job with the majority of my landsape panoramas during the day with medium to telephoto lenses. It’s only when I’m stitching spherical panoramas, 360° cylinders, bokehramas & macroramas with a shallow depth of field, and night sky panoramas that I need more manual control of the alignment, and that’s when the index marks and no-parallax point become quite critical. Saves a great deal of time vs. manually fudging and re-positioning photos to align, or stretching and warping a bad stitch to fix a bad horizon, etc. If you have a click-stop rotator under your panning head with detent intervals, like Nodal Ninja’s RD-16 II, it saves even more time in the field, and is even more accurate/reliable with less chance of user-error. You don’t have to look at your index marks to know you are at the correct position when panning left/right, and if you are blending sky and ground exposures for night photography, your photos will align more accurately for blending. Since the earth is rotating, you have to shoot all your shorter exposures of the night sky first so the stars don’t move too far, then repeat your panorama for the longer ground exposures to have a bright enough foreground. If you shoot both exposures before re-positioning, the stars will have moved too far to stitch properly. This usually only plagues those of us crazy enough to stay up all night shooting the Milky Way though. Haha! Click-stop rotators are also very useful for telephotos and gigapans where you have to shoot hundreds of photos. You can shoot a gigapan with a manual panning head almost as fast as with a robotic panning head if you have detents and don’t have to constantly check the viewfinder or index marks. I wouldn’t bother investing in one unless you enjoy shooting panoramas frequently, but they aren’t very expensive and make life a lot easier! Great tips! Thank you. After reading your article I purchased a Sunwayfoto CR-30 nodal and a Neewer Pro 69mm Tripod Leveling Base with Offset Bubble Level. So, I was able to get a basic set up for well under $200. I’m still waiting on the Base, but the CR-30 is pretty impressive. These tools, and your advice will certainly improve my panoramas. Excellent article and discussion. However, for me it’s about cutting down on the lenses I need to carry. Some of my best panoramas were shot on outings where I took only a 50mm lens out on a hike to reduce weight. Nasim: I shoot with a Nikon D610 and the Nikkor 24-120mm f4 lens; shoot panos between 60-70mm. Would the Sunwayfoto DMP-200R nodal slide work with my setup? Many thanks and great article! Nasim: please, disregard my query above. I bought a rail and a custom L-Bracket for my D610 and they work like a charm. Thank you! I can answer some of this if Nasim doesn’t mind. I shoot hundreds of panoramas a year, many of them gigapans and 360 panos. I usually shoot them completely manual with a fixed focus (sometimes focus stacking), fixed exposure (sometimes HDR), fixed white balance, etc. ; everything as manual as possible. If I’m shooting a multi-row panorama at twilight (dawn or dusk) when the light is rapidly changing, then I’ll start with the sky for dawn and shoot the ground last so the light balances a little better between the two, and I’ll start with the ground at dusk and shoot the sky last. This way I’m getting the most light possible on the ground to balance the changing sky. Either a click-stop rotator (Nodal Ninja makes some good ones) or a robotic panning head help with shooting as fast as possible to accommodate moving clouds, changing light, etc. Even so, during that blue hour transition of civil to nautical twilight, the quality of light changes rapidly, especially the color temperature as you noted. To fix that I often ramp my exposure and/or my white balance from the first frame to the last frame with either Gunther Wegner’s LRTimelapse (free up to 400 frames) or Jeffrey Friedl’s Timelapse Support Lightroom Plugin. It may seem counter-intuitive to use timelapse software for panoramas, but really all you want to accomplish is a simple, smooth ramp from exposure A to exposure B (or white balance) and either program works great for this in Lightroom! You can’t use any of the deflickering features of course with a panorama because your content between frames is dramatically different (vs. a timelapse of consecutive frames), but if you used a fixed exposure you won’t need to anyway. If you accidentally used aperture priority or auto ISO then you could also try “Match Total Exposures” first in Lightroom, but in my experience this does not always work well, especially for twilight panos, and ramping it after is more challenging. A fixed exposure is much easier to work with in post-production. Secondly, many of the newer tools in Lightroom such as clarity and dehaze are not global adjustments. They are very localized sliders and will not be applied equally between images of different content. The same can happen with the highlights, shadows, whites, and blacks sliders. So you can end up with exports from Lightroom where your sky is quite a bit different in brightness between each frame depending on the percentage of sky that appears in that frame, and they will not stitch well in Photoshop or PTGui. Lightroom’s own limited panorama feature seems to recognize this and adjust for it, but if you export to TIFF to stitch in another app like Photoshop or PTGui you’ll notice it with extreme edits. Go careful with those sliders, or switch to the older 2010 process in the develop module for more consistency (losing those tools). Lastly, PTGui (Pro version only) has fantastic vignetting, exposure, and white balance optimizations that can help with very subtle differences between images. I try to fix as much as possible upstream with shooting technique and RAW editing first though, so it doesn’t have to struggle with big differences between images. Thanks Aaron, some great tips there. Much appreciated. If Nasim gets a chance I’d love to know how long it roughly took to get all the exposures for the 400mp panorama. I own a D750 and im planning to shoot Panoramas (second trial) for my trip to Scotland next month. I shoot with a Nikon 16-35 f4. I shot some handheld on my previous trip to England but i noticed these parallax errors when i was stitching them in Photoshop especially with foreground components. So im gonna try a panoramic head this time and Its a road trip so im gonna keep the Panoramic head setup and in the back seat of the car for the whole trip and only use it when i take a panorama. For a guy who wants to try this kinda setup and dont wanna spend so much, which is the cheapest setup that can work for my camera lens combination? Are any of these or similar a viable option? I’m not asking you to select a product for me from the above rather asking which kind of product i should search for..
That means you’d want at least a 150-160mm long nodal slide to leave room for your camera clamp. The SunwayFoto CR 30 would be too short at 85mm, if that chart is close to correct. A Nodal Ninja 6 would be an ideal panning head for your D750 and pretty much any lens from 8mm fisheye to 200mm. Lots of people at panorama workshops are very happy with it. It’s on the lower end cost for high quality panning heads (which easily hit 2-3x more), but not the cheapest setup you could find. It would probably make you a lot happier than most things that are cheaper though, as far as weight, size, quality, and ease of use goes. You could also try to find an older Nodal Ninja 3 on eBay or what not, but I still think the slide would be too short for that 16-35mm f/4 (it would be fine with a prime lens), and it wouldn’t have the nice click-stops on the rotator that the Nodal Ninja 6 has. Some zoom lenses just have a lot of parallax because the nodal point is so far out from the camera sensor, requiring a long nodal slide. I guess one would have to go thru the calibration of finding the NPP based on the lens-body combination, as there are infinitely many combo, made much more by the types of L-brackets used. My Canon 1635 f4 fortunately has only one NPP across all focal lengths, so it is a breeze to just remember one offset distance and that’s it. I’ve never heard of a zoom lens having a fixed entrance pupil at all focal lengths, I’m not sure that’s optically possible. :-P Were you checking through the viewfinder or via LiveView? The latter is more accurate, checking from the sensor itself. You’ll most likely find that it shifts around a few mm on the nodal slide. But, depending on the distance between your closest and furthest subjects, the accuracy might not be that important. Also, depending on what you were viewing to calculate it (the distance), you might not have even been able to even measure it. Strange it might seem, but it’s true. Using live view to check for NPP at extreme left and right panning. My 2470 has two NPP, one from 24mm up to approximately 60+mm, and another NPP at 70mm. In either lens, when stitching in autopano, the stitch errors are less than 3%. Interesting. I do something similar myself and at workshops. We setup a pencil or similar item about 1m away and the further item more like 6-9m away. We usually test about f/8 since the aperture also makes a difference, but at some point the further object will no longer be sharp enough to see and f/8 is often the sweet spot of a lens. We turn on grid mode in live view and move the camera/tripod around until both pencil tips line up on the center line, then we swing to the left or right and zoom in and move the camera back and forth on the nodal slide until the tips line up again. They should line up equally for both sides of the frame when zoomed in when you get it right on the nodal slide. Quick and easy. :-) You can verify it in the field in a hurry too with the same method, but I think it’s more precise with pencils indoors. While useful, there are some common miss-understandings about shooting and post noted here. 1. Using a pano head is best when using lenses below 100mm unless you have mastered manual rotation. Even then, using a pano head is better than not. Using a pano head with detents is also better, using a robot head is even better if it gives you xml info on the shoot. 2. Using a pano head is still valid above 100mm lenses to simply center the lens, this will help but pretty much all parallax is gone after 100mm. You can easily shoot, but perhaps not stitch giga pans well without a pano head beyond 100mm. 3. The idea of need to level for the shoot is greatly overrated. While not a bad idea or something that should be done, it’s simply so easy to do in post that if time is a consideration, forget about it and shoot. Thanks for sharing your hard earned knowledge Nasim. I found this article really helpful as I was frustrated with some of poor panos that I have done but overwhelmed at the cost and multitude of options for the proper pano rigs. I am getting into astro photography and am inspired by the multi-row shots of the Milky Way I have seen on social media, but now I realise that getting a full pano rig will be overkill for me, at this stage at least. I think I will be much better off with a single slider, as you mentioned, and putting my $ into a astro tracker. You saved me big time! Great informative article! I already own an Arca-Swiss tripod. Which single nodal slide would you recommend for single and multi-row panos? – Leveling base allows you to level the panning base of the ballhead and that’s all you need, but it is bulky and heavy and costs a lot (RRS TA-U-LB costs $215 and weighs 335g). It is also not easy to mount/dismount it to avoid extra weight when you don’t need it and only add it when shooting panos. – Panning clamp, if bought separately from the head, is also expensive and heavy (RRS PC-LR costs $255 and weighs 336g) but more flexible in use. Besides, you can buy it as part of the ballhead and then the extra cost is only $160 and extra weight is only 182g for RRS BH-40. However, to use panning on the clamp, you must have the camera mounted perfectly horizontal, otherwise rotating the clamp will have camera view draw an arc and this will be obviously a problem with framing and stitching. I am intentionally not discussing parallax challenges here and just want to make the right decision on the panning mechanism itself. I have the RRS TA-3-LC-HK leveling base in a 75mm video bowl of my tripod. I’ve never really seen the practicality of the TA-U-LB vs. a ballhead in comparison, because all of the weight is above the fulcrum when leveling, where with the larger TA-3-LC-HK you have one hand below the fulcrum when leveling, and not as much load to flop around. In your case, I think I would go with the PC-LR mounted to the stem of the BH-40. You won’t get any arc at all when panning because you are panning above your ballhead, and not below it. If you want to do a multi-row panorama, or a single row tilted down, then you’d need a multi-row panning head on top of that panning clamp (don’t tilt the ballhead down in other words, or you won’t be level anymore). So you say “You won’t get any arc at all when panning because you are panning above your ballhead, and not below it.” My understanding is that if my camera on the ballhead is leveled itself (i.e. the lens axis is always horizontal, parallel to the Earth surface), then of course my panning clamp plane is horizontal, and all is well. But if I am taking, say, a panorama of a canyon (means my camera is intentionally tilted and looks down at an angle), or a panorama of the mountains or skyscrapers (so my camera is tilted up and looks up to the sky at an angle), then I have an arc problem. Correct? In this scenario leveling base would help because I could use it to level the base of the ballhead and use panning ring there (below the head), as opposed to panning at the clamp. Am I missing something here? P.S. Yes I do understand the fulcrum considerations… if I decide to go with a leveling base then choosing the model with the right fulcrum will be my next challenge – thank you for this tip!